#8 Dale Earnhardt Jr / Belly Button Ring, by Goldmine. Officially licensed. All earrings are Hypo-Allergenic, and the posts are fashioned in surgical stainless steel. Officially licensed. 14KT Gold Wires. 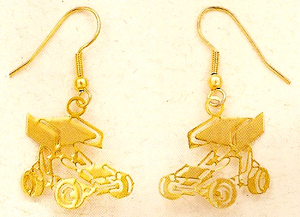 All earrings are Hypo-Allergenic. #12 Ryan Newman / Belly Button Ring, by Goldmine. #20 Matt Kenseth / Belly Button Ring, by Goldmine. Officially licensed Matt Kenseth belly button ring. All belly button rings are - 316L stainless steel - 14 gauge - bar size 3/8" - ball size 5mm and 8mm. 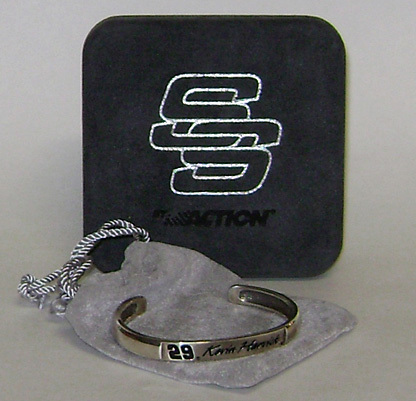 #29 Kevin Harvick / Ladies Silver Bracelet, by Action.